Enveloped, spherical. Diameter from 80 to 120nm. Segmented Negative-stranded RNA linear genome, L segment is between 6.8 and 12 kb, M segment between 3.2 and 4.9 kb and S segment between 1 and 3 kb. Encodes for four to six proteins. The viral RNA dependent RNA polymerase (L) binds to a promoter on each encapsidated segment, and transcribes the mRNA. Transcription is terminated by a strong hairpin sequence at the end of each gene. These are capped by L protein during synthesis using cap snatching . Virus attaches to host receptors though Gn-Gc glycoprotein dimer, and is endocytosed into vesicles in the host cell. 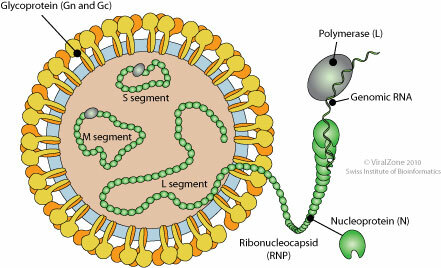 Fusion of virus membrane with the vesicle membrane; ribonucleocapsid segments are released in the cytoplasm. Transcription, viral mRNAs are capped in the cytoplasm. The ribonucleocapsids buds at Golgi apparatus, releasing the virion by exocytosis. The nairovirus L protein contains an ovarian tumor domain-containing deubiquitinase that targets activated RIG-I to control innate immune signaling.